This cake was supposed to be an orange version of the Strawberry Soda Pop Cake from Mommy’s Kitchen but the whipped topping melted all over the place. I thought the cake was cool enough but I was wrong. Thankfully I had bought some extra vanilla pudding mix when we went grocery shopping so I was able to salvage the cake. Now if you’re looking for a cake to come out in nice pretty slices stay far away from the recipe. It is so moist that it falls apart when you cut it but the taste is amazing. Prepare cake according to directions on box. Cool completely. Seriously even if you think it’s cool enough give it just a bit longer.Poke holes in cake with fork. Mix together pudding mix and milk. Let set until soft set. Add drained oranges. Pour over cake. Refrigerate until serving, store leftovers in the fridge. Oh, I just love your post!! Recipe gone wrong but tastes amazing!! I’ll keep this one in the “kid friendly” file! Thanks for sharing! 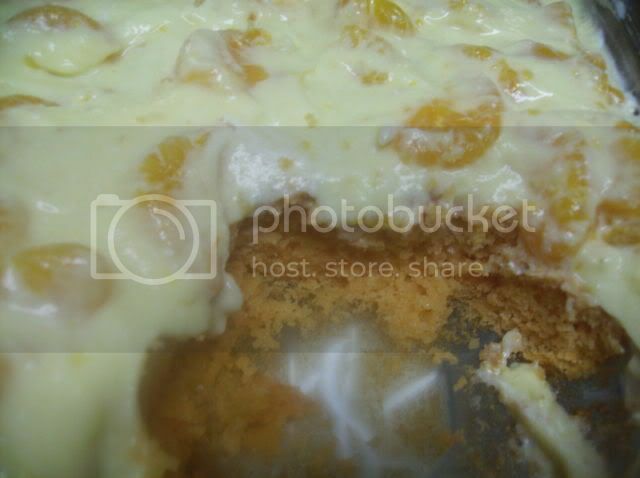 Orange dream cake sounds fantastic! Yum! It is fantastic. I really need to make it again soon. Maybe for our Easter cook out.